Long-time Blairsville resident Henry Goines is a great example of what it means to serve, both your country and your community. Henry is a Navy veteran who served on the USS Okanogan during the Korean War and fought in several major battles including the Inchon Invasion. Recently retired after over 40 years as a local businessman, Henry has a new mission. 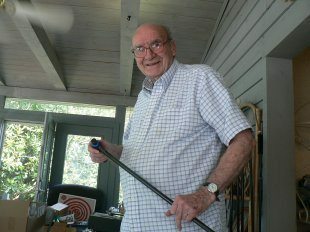 At 81 years old and not quite as steady as he used to be, Henry decided to make a walking stick. “I made one for myself and a few people saw it, and it just grew from there,” he said. Henry now makes dozens of these walking sticks, and gives them away to veterans. He has sent them to California, Washington, and Kentucky, and charges only shipping. Henry has a book full of names of the veterans he has made them for. It contains things like the service branch, the war or time period they served in, and the height of the recipient. He has made walking sticks for servicemen ranging in height from 5’2″ to well over 6′. “You measure the height from the floor to their hand to get the right size,” he explained. Veterans aren’t the only ones who can enjoy these custom walking sticks. Henry decided to do more. “They don’t have to be a veteran if they need them,” said Henry. Word got out to the local Senior Center, and they have been keeping him busy. “He’s doing a great service to the seniors over here,” said Kathy Hill, Director of the Senior Center. The design evolved over a period of time. “When I first came up with them they were very crude,” said Henry. He struggled with the finish, because he wanted them to look as good as they worked. He has revised and improved the design over time, and now has a very serviceable and attractive product. Local manufacturer Panel Built, Inc. has had the privilege and the pleasure of being part of this process. “I could never get the paint right,” said Henry. His son Steve Goines, of Goines Industrial Printing suggested powder-coating the steel tubes for a smooth finish, and recommended his Industrial Park neighbor, Panel Built. “When Henry approached me and I realized what he was doing, I told him we’d be happy to help,” said Mike Kiernan, President of Panel Built. 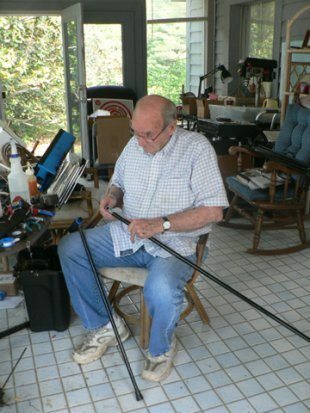 “We are proud to be a part of this.” The Panel Built Steel Line is powder-coating the steel tubing for the walking sticks free of charge and Henry is grateful for this small service. Whether you are a corporation or an individual, it’s good to give back. Panel Built is grateful for our Military, retired or active duty, and sends regular care packages to our troops overseas through AnySoldier.com.